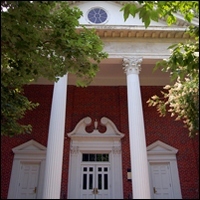 Emory University's 260-seat Performing Arts Studio was created within the church building adjacent to the Burlington Road Building. The Studio is now an active venue for smaller music recitals, theatre performances and guest lectures. Parking: Parking is available in the Lowergate South Parking Deck. Out of the deck, walk east on North Decatur Road toward Burlington Road. Cross Burlington Road, and the studio will be ahead on the left.